The Universal Century, with its history of colonization and wars, passes into posterity, and time flows on. Mankind enters a new age of seemingly endless peace and prosperity called the "Regild Century". The year is R.C. 1014. The Capital Tower, an orbital elevator, connects earth and space. Due to its role in supplying Earth's power by transferring Photon Batteries from space, it is worshiped with a religious fervor. Bellri Zenam, a cadet in the Capital Guard formed to protect Capital Tower, is participating in his first non-simulated exercise when he is attacked by the powerful but unaffiliated "G-Self" mobile suit. He manages to capture the G-Self while piloting a "Recten" maintenance mobile suit. 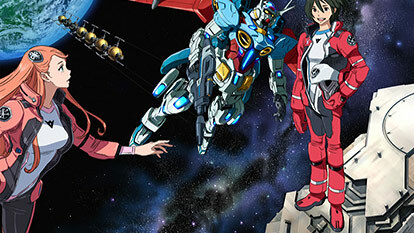 However, seeing the G-Self's pilot, a young space pirate named Aida Rayhunton, stirs something within him, as does the G-Self which he was sure he'd never seen before. Why does the G-Self accept Bellri as a pilot? Aida's mission to attack Capital Tower. Bellri's destiny as a chosen pilot of the G-Self. The truth which will shake the Regild Century. It was all the beginning of the Reconguista.